1 - Being a site about Anime / Manga or about Japanese culture. 2 - Being an organized site with a nice layout. 3 - Put Our Button on your site. 4 - Have an average of 400 daily visits. 4 - Have an average of 200 daily visits. gan sdh saya psang di home page, cek aja. REIKAI ANIMES : Hello, yes I accept being a partner, already added your banner, add me, Thanks! Seu Banner Ja Foi ADD ! SE VC NAO ACEITAR A PARCEIRA POR FAVOR NOS AVISE ! Cra copy Banner ente gmana???? 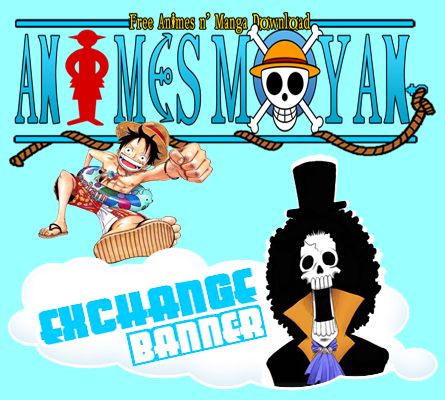 parceria aceita..www.animesrange.com.br...agradece e sucesso a todos!ja adicionei seu banner..
bannernya dah di pasang gan..
Ola Aceitamos Sua parceria, Adicionamos e seu banner. Se Nosso banner não for adicionado em 48 Horas a parceria sera disfeita. Gostariamos de fazer parceria com vcs. seu banner ja foi adicionado. ja adicionei o seu banner agora aceite o meu. Link kk sudah saya pasang di blog saya.. Number of Views : An avarage of 500 daily visits. kalau mau tukeran yg 468x60 harus 400 visitor yah tiap harinya?